Cub Lake is labeled in the high res view. Moose are a fairly common sight on the west side of the Continental Divide in Rocky Mountain National Park (the Continental Divide forms the skyline in the 3d view.) They're still pretty uncommon on the east side, however, so it was quite a treat. On the subject of Rocky Mountain National Park, we created some 3d views for a recently released website - rockymountainnationalpark.com. This site highlights the spectrum of activities available in and around the Park and is worth a visit. Here's an example of one of the images we created. Their web team added the text and symbols and highlighted the trail segment. Pikes Peak forms the backdrop; Rampart Reservoir is at the right, just above center. Spot fires - caused by ember casting - show up as isolated polygons. Notice the one to the right (north) of Rampart Reservoir. This also highlights the incredibly difficult terrain that firefighters have been dealing with. You can see some of the threatened, and lost, neighborhoods in the left foreground (the dark spot is caused by a cloud shadow in the aerial photo.) I grew up in the Colorado Springs area and most of my immediate family is still there. Many thanks to the firefighters battling the blaze and best of luck to those who've lost their homes. (Click for higher res version). In January of 2012, Zia Design Group was approached to by a local environmental consulting firm to help them address a request for a specialty mapping product for a client in Wyoming. The request was to produce a "Beaver Creek style ski area map", but after design and content issues were addressed the proposal, and ultimately the product produced, was a unique Zia styled 3D map using key surface modeling elements created by CTM. GIS info from the clients in-depth data collection of their property provided the exacting boundary and object locations to produce the map. Ed and Heidi of CTM worked closely with me to formulate a series of overlays of imagery and GIS that defined the extent of the map. Several technical and artistic techniques were used to develop the look and feel of this map. Some key aspects is the use of graphic object development that is then placed using GIS image processing techniques from CTM's suite of program calls in 'Edware' . This allows for graphic representations of vegitation (trees in this case) based on field data that we then transposed from image analysis to graphic representations. This allows for accurate distribution and placement of our created 2 1/2D objects on a texture mapped 3D surface. This is all meant to create and render the 'feeling' of what the landscape looks like. It is a balanced orchestration of art and technology. Thanks to CTM for their efforts on this project! State Parks - recently merged with the Division of Wildlife - is facing an incredibly challenging fiscal environment. Due to budget constraints, General Fund revenue is gone. They're relying on fees, grants and allocations from the the Colorado Lottery and GOCO (Great Outdoors Colorado). In this new financial landscape, they've got to partner with individuals and organizations to make things happen at the Park. Staunton State Park is sure to be a very popular destination - it's only about 40 miles from Denver. It'll offer a wide spectrum of outdoor amenities: from hiking and riding trails to technical rock climbing to outstanding wildlife viewing opportunities. To find out how you can help, check out http://www.stauntonpark.com. In this post, I introduced a hybrid attenuation model that combines contributions to attenuation from distance and elevation. For simplicity, if we "clear the air" at higher elevations, we can simulate the crisp high country views while adding valley haze that increases with distance from the viewer. For public meetings, photo simulations can answer questions about visual impacts to the most laymen of crowds. These images were generated for a proposed silo on the NREL campus near Golden, Colorado. The Edware on the Web Elevation Server is the talk around the proverbial water cooler this week. We are testing the software, and based on feedback from our reviewers, we are really excited about the possibilities. Yesterday, while talking to a reviewer about the future of EdWare ES, the topic of visualization of EdWare imagery in Google Earth came up. In past posts we talked about using the Edware ES to brand web maps...yesterday's conversation reminded us that the output from elevation server can be brought in to brand a Google Earth project as well. As we all already know Google Earth is a powerful visualization software application. The top image – of the Grand Canyon – is a screen shot taken straight from Google Earth. In my opinion, the shadowing in the foreground (southeast corner) of the image provides a compelling view of the canyon. Obviously the tiles in the foreground were captured when the sensor on the satellite was at some angle past nadir. While informational, the first image lacks continuity and clarity. I would go so far as to say that the tiles form a dissonant patchwork of imagery. The second image (below) was developed by the EdWareontheWeb Elevation Server; the KMZ was then imported into Google Earth (the kmz for this file can be accessed from this link). Besides providing a clean, consistent base layer I think the addition of the EdWare Elevation Server imagery gives me a better idea of what the landscape actually looks like. 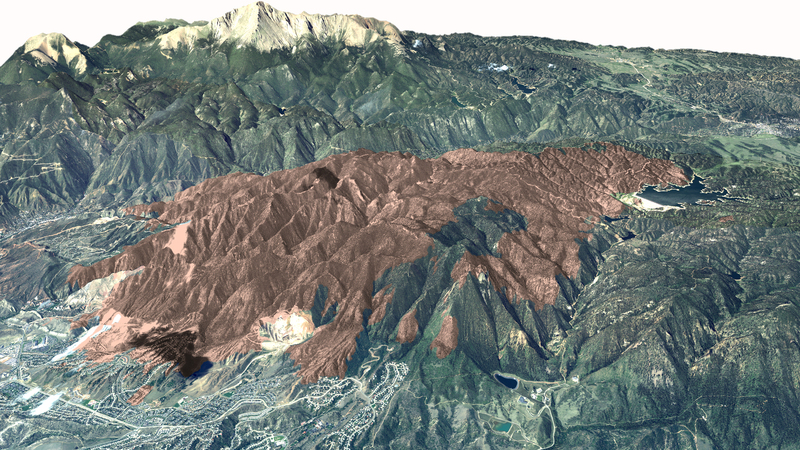 Hillshade or shaded relief imagery provides an informative view of topography. This technique involves illuminating the virtual landscape with a light source, most commonly a directional light source located to the northwest (upper left) of the image area. Directional light sources are typically implemented as a vector, indicating the direction to the "sun" or light source. Alternatively, you can use point light sources, located at specific locations. Direction vectors are then calculated from each locale on the landscape to the point source. Mixing light sources can help accentuate landscape features that aren't easily brought out with a single source. This feature is coming soon to the elevation server. This bizarre landscape juxtaposes regular and random geometries. A blue cylinder pierces a fractal monolith while a sphere emerges in the foreground, all faded in an attenuating haze. Periodically we like to showcase our clients' successes - successes that we feel we've made some humble contribution toward. Beartooth Publishing, from Bozeman, MT, has been producing a plethora of award-winning maps. They've published 2 maps that have won "Best of Category" for recreation and travel, and three additional maps winning "honorable mention" in Cartography and Geographic Information Society's annual map competitions. The latest (2010) winner was for Yellowstone National Park (cover shown below).